Strengthening the economy has been one of the public’s top priorities going back even before the Great Recession, although the share of Americans citing it now is not as high as the 87% peak in 2011 when the nation was still struggling through an on-and-off recovery. This year, the economy is still at the top of the list with three-quarters of Americans calling it a top priority, although for the first time in five years, defending against terrorist attacks was cited by a roughly equal share of the public. How Americans view the economy has been a key factor in how favorably or not they have viewed President Obama, who plans to use the State of the Union address to lay out several major economic proposals, including one that would raise taxes on the wealthy and on large financial firms in order to provide middle class tax cuts. Here are key takeaways from our surveys on the state of public opinion about the economy. 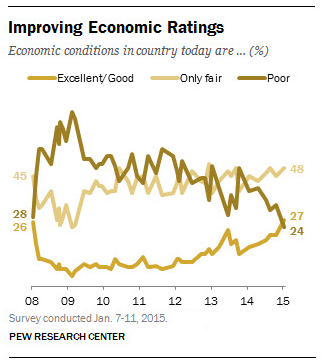 1More Americans see the economy as improving. Amid accelerating economic growth and falling unemployment, 27% of Americans rated the economy as excellent or good earlier this month, while 48% said it was only fair and 24% called it poor. The percent rating economic conditions as poor has declined nine points since October (from 33%). This marks the first time in Obama’s presidency that about as many have described the economy as excellent or good (27%) as poor (24%). Democrats are almost three times as likely to rate the economy as excellent or good than Republicans. About two-thirds (66%) of Americans say the economy is recovering, but not strongly, compared with just 16% who regard the recovery as strong. Expectations for the economy have improved somewhat with 31% saying it will be better a year from now compared with 27% last October. 2Ratings of Obama’s economic impact have also improved some, but they were never high. Nearly four-in-ten (38%) say Obama’s economic policies since taking office have made economic conditions better, while 28% say they have made the economy worse, according to our Jan. 7-11 survey. Three-in-ten (30%) think they have not had much of an effect. On balance, this is the most positive rating of Obama’s economic impact since December 2009. The survey also found that more Americans have more confidence in Obama than Republican leaders to do the right thing on the economy: 49% have a great deal or fair amount of confidence in Obama compared with 37% who say they have more confidence in GOP leaders. 3Positive views of the job situation have edged up, but most Americans still say jobs are hard to find. When it comes to job opportunities, 57% say that jobs are difficult to find in their community, while 36% say that there are plenty of jobs available, according to our recent survey. Views of job availability have edged higher over the past several years as the unemployment rate has declined. The percentage saying that there are plenty of jobs available in their community has not been higher since November 2007, before the start of the Great Recession. People under 50 are more likely than people over that age to say there are plenty of jobs available, as are people with higher education and income. 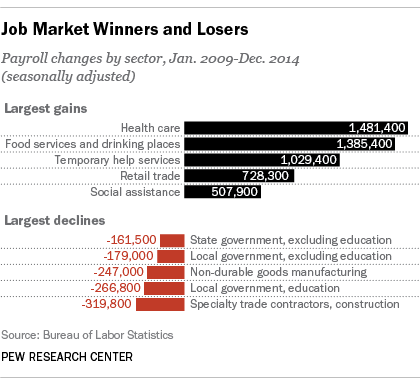 4Since Obama took office, the service-sector has expanded as public-sector jobs have contracted. There has been an overall gain of 6.4 million more non-farm payroll jobs last month than in January 2009, which represents a 4.8% increase. All of that growth came from the private sector, while the public sector shrunk: Private payrolls have added 7 million jobs over Obama’s presidency, while government payrolls (federal, state and local) have contracted by a combined 634,000 jobs. The service sector has generated many of the new jobs, particularly in health care, temporary help, and the bar, restaurant and food service business. 5Despite the improving economy, most Americans continue to say that they are falling behind the cost of living. Overall, 55% said in the Jan. 7-11 survey that their family’s income is falling behind the cost of living, while 37% say it’s staying about even; only 6% think their family income is going up faster than the cost of living. Views on this question have shown no improvement over the course of the last year; in August 2014, 56% said they felt they were falling behind the cost of living. 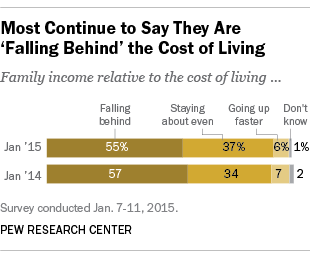 Today, about two-thirds (65%) of those with family incomes of less than $30,000 a year say they are falling behind. 6The public is divided over how much the government should regulate financial institutions. As many said that the government had gone too far regulating financial institutions and markets, making it harder for the economy to grow (45%), as said it hadn’t gone far enough regulating financial institutions and markets, leaving the country at risk of another financial crisis (47%). Views on this question are little changed from September of 2013. 7 Most Americans see economic inequality as growing, but they are divided on solutions. A January 2014 survey found broad public agreement that economic inequality has grown over the past decade but wide partisan divisions on what to do about it. About two-thirds (65%) of the public believed the gap between the rich and everyone else has increased in the last 10 years. This view was shared by majorities across nearly all groups in the public, including 68% of Democrats and 61% of Republicans. Among Democrats, 90% said the government should do “a lot” or “some” to reduce the gap between the rich and everyone else. 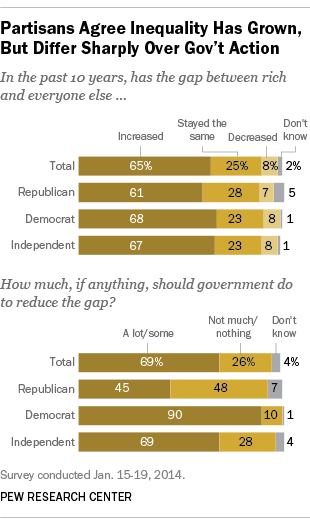 But only half as many Republicans (45%) think the government should do something about this gap. 8Wealth inequality has widened along racial, ethnic lines since end of Great Recession. The wealth of white households was 13 times the median wealth of black households in 2013, compared with eight times the wealth in 2010, according to a new analysis of data from the Federal Reserve’s Survey of Consumer Finances. Likewise, the wealth of white households is now more than 10 times the wealth of Hispanic households, compared with nine times the wealth in 2010. The current gap between blacks and whites has reached its highest point since 1989, when whites had 17 times the wealth of black households. 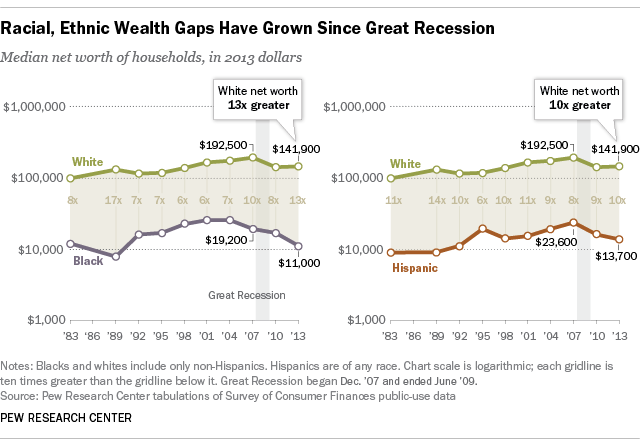 The current white-to-Hispanic wealth ratio has reached a level not seen since 2001. 9There is a big partisan divide over using changes in tax policy to help the poor. Three-quarters of Democrats favored raising taxes on the wealthy and corporations to expand programs for the poor as the better approach to lessen poverty, according to the January 2014 survey. Republicans, by about two-to-one (59% to 29%), believed the government could do more to reduce poverty by lowering taxes on the wealthy and corporations in order to encourage more investment and economic growth. See our overview on President Obama’s 2015 State of the Union, and read our related fact sheets on immigration, energy and the environment, and privacy and cybersecurity.